Globally, India ranks fourth in energy consumption, but it is not well endowed with energy resources. Being the second most populous country in the world, how India manages its industrialization and urbanization process will matter for national and global concerns about energy efficiency, pollution, and climate change. Further, India is home to about 350 million people who lack access to electricity, which is more than a quarter of the 1.4 billion people without access to electricity around the world. Although the current installed capacity of India’s power system is the fifth-largest system in the world, it is nonetheless insufficient to meet India’s demand. Indeed, electricity consumption in India is only around 566 KWh per capita, compared to the world average of 2,782 KWh per capita. Moreover, electricity shortages are frequent in India and are estimated to cost the country around 7 percent of its GDP. Since electricity is an essential resource for production, it is natural that about 35 percent of all plants in Indian manufacturing have insured themselves against outages by self-generating or otherwise substituting away from grid electricity. A recent paper called “Spatial Dynamics of Electricity Usage in India” from the World Bank uses enterprise data to look at this relationship between growth, geography, and energy efficiency in India. By increasing energy efficiency, improving access to technology and promoting renewable fuels—the report finds—policy makers can reduce the country’s greenhouse gas emissions. 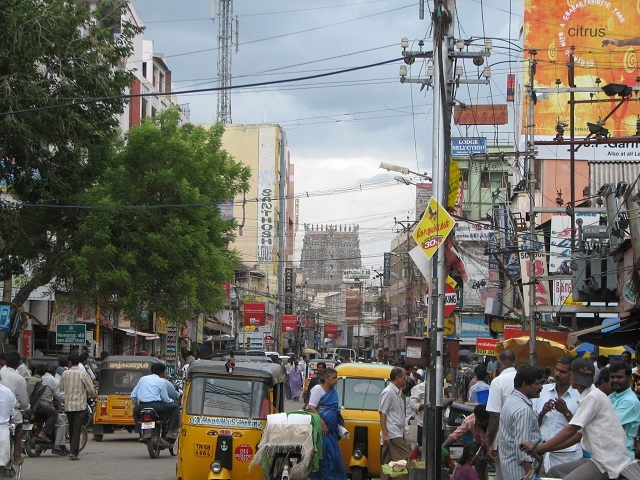 Urbanization in India is taking many twists and turns. Organized manufacturing is moving out of urban areas while unorganized manufacturing is transitioning towards urban areas. The organized sector has relocated to rural sites along major transport corridors, like the Golden Quadrangle highway network. This has energized medium-density cities to become an important part of India’s manufacturing growth, an area where India has traditionally struggled. Examining these changes through the unique lens of energy usage at the enterprise level also fills a critical knowledge gap. Very little is known whether energy efficiency in India is higher or lower in urban or rural settings, leading or lagging regions, formal or informal enterprises, young or old enterprises, and in purchased energy or own-firm provision. While experts instinctively rank some of the dimensions of energy efficiency, the trends in India challenge assumptions. For example, we might often suspect that urban settings reduce the cost of electricity use per output level due to denser customer bases and more-efficient plant sizes, but the largest plants in India are moving towards rural locations—often provisioning some of their own energy, and building new plants in this process. This leaves us with questions as to whether the way India is urbanizing and transforming space is improving or worsening energy efficiency. The report establishes, however, that electricity consumption per unit of output in urban areas, in both organized and unorganized plants, has declined. In rural areas, by contrast, electricity consumption per unit of output for organized sector plants peaked in 2000 and declined afterward. This result comes out even stronger during periods of high economic growth and energy price increases. The usage of electricity per unit output is remarkably high in states such as Madhya Pradesh and Orissa, and in some cases twice the level of India as a whole. By contrast, states like Delhi and Haryana display electricity consumption levels that are consistently lower than the national average. The paper found that more developed states typically have lower electricity consumption levels per unit of output; however, the movement of manufacturing plants over locations limits the strength of these conclusions. The energy-intensive industries (e.g., iron and steel, fertilizer, petroleum refining, cement, aluminum, and pulp and paper) account for a bulk of the energy consumed in the sector. It’s important to note that these industries have greatly improved energy efficiency since the late 1980s. Many factors account for this trend, including greater competition, rising energy prices starting in the late 1990s, and the promotion of energy efficiency schemes. Nonetheless, various industries remain inefficient by either national or international standards, with substantial potential for energy savings ranging from 46-88 percent for textiles, 43-94 percent for paper and pulp, to 51-92 percent for iron and steel. How has India’s urbanization and spatial transformation impacted the aggregate energy consumption of these industries? The World Bank found that most reductions in usage came from lower usage in existing sites of activity (defined through state-industry-urban/rural cells). The second biggest factor was the lower usage levels among fast-growing sectors. In contrast, spatial movements of manufacturing activity across India did not significantly reduce electricity consumption per unit of output, but may have increased it. This is due in part to the split nature of these changes, with organized and unorganized sectors migrating in opposite directions. Given the multiple challenges in India’s energy sector and its limited resources, a better understanding of the spatial patterns of energy usage can help in defining a more focused and targeted energy policy. For instance, the report suggests that the organized sector is moving to rural regions, and are self-generating electricity—at least in part. Therefore, for India, effective policy may need to extend beyond urban regions, and also consider the incentives and regulations that govern self-production of electricity. This blog was adapted from a post on VoxEU here.